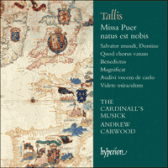 This volume presents Tallis’s extraordinary seven-voice Mass, Missa Puer natus est nobis, which dates from the Catholic reign of Mary I. Andrew Carwood writes that this Mass is ‘something of a marriage between the English and Spanish Chapels, not only in its scoring but also in its sound world … the piece is sonorous and rich, a gorgeous background tapestry for a solemn celebration of the Mass, and has wonderful dramatic effects including the use of antiphony or dialogue between voices. It is a shame that Tallis wrote no more in this vein but, perhaps like Mary’s short-lived Restoration, it was a piece of the moment not to be repeated’. Other works recorded here include what is possibly Tallis’s earliest work, the four-part Latin Magnificat, and the gloriously splendid Videte miraculum, a masterpiece with a ‘rich palette of colours, enhanced by suave melodic writing with a slow-moving harmonic pulse tinged with heart-achingly gorgeous cadences’.